ORLANDO, Fla. (AP) — McKenzie Milton threw for two touchdowns and ran for a third, helping No. 11 UCF extend the nation's longest winning streak to 22 games with a 35-24 victory over Navy on Saturday. Milton completed 17 of 21 passes without an interception, and the Knights (9-0, 6-0 American Athletic Conference) remained one of four unbeaten teams in the Football Bowl Subdivision, along with Alabama, Clemson and Notre Dame. Dredrick Snelson scored on receptions of 34 and 12 yards for UCF, which stayed atop the AAC East Division standings and on course to be part of the discussion about which teams are worthy of berths in the College Football Playoff. The Knights are 12th in the latest CFP rankings. Beating Navy (2-8, 1-5) won't exactly silence critics who feel the defending AAC champions are undeserving of a higher ranking because of the strength of their schedule. The Midshipmen, coming off a 42-0 road loss to Cincinnati, have lost seven straight games, although they did rush for 374 yards Saturday after being limited to a season-low 124 on the ground the previous week. Zach Abey scored on runs of 5 and 8 yards, finishing with a team-best 85 yards rushing on 26 carries for Navy. Tre Walker ran for 82 yards on seven attempts, and Mike Martin ran for 51 and a fourth-quarter TD for Navy, which only threw the ball twice. Navy: The Midshipmen finished a three-week stretch in which they lost to Notre Dame, Cincinnati and UCF, who were a combined 25-1 entering Saturday. 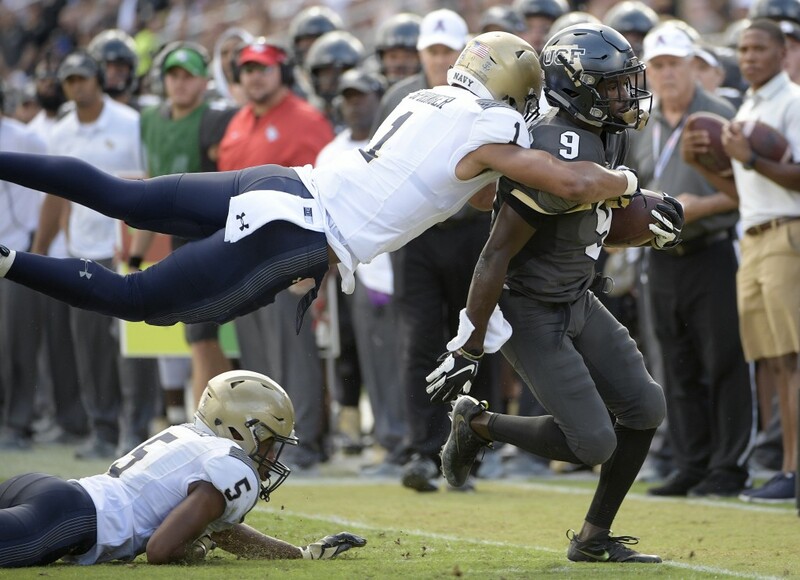 Their chances of slowing UCF's potent offense hinged on getting its own running game going and dominating time of possession to keep Milton off the field. UCF: Milton was sharp in his second game since sitting out a road win over East Carolina with an undisclosed injury. The junior from Kapolei, Hawaii, hit 10 of his first 11 passes for 106 yards, completing throws to seven different receivers. He has at least one TD pass in 22 consecutive games. The Knights dropped two spots in the Top 25 after yielding 670 yards and 40 points in a 12-point home victory over heavy underdog Temple. They don't figure to earn any style points this week, either, after allowing the Midshipmen to hang around until the fourth quarter. Navy: Home vs. Tulsa, Saturday. UCF: Hosts No. 25 Cincinnati in key AAC matchup, Saturday.